So, it looks like Wochit News posted coverage of our Four Horsies Kickstarter on YouTube after spotting us on CNET! But that was in 2015. And they didn't tag us or link to our Kickstarter sooo.... we didn't find out about this video till now. But anyway, it's hilarious and worth sharing! The voiceover is magical. Click through to Go Figure News to read the review of our new 4" Lil Maddie figures. Click here to purchase the 4-piece Pocalypse Now Gift Pack, or here for the individually-boxed 4" Maddies. Four Horsies have been delivered! Pocalypse has begun! Are you ready fore the Pocalypse?! You better be, because it's coming right to your door! Our Kickstarter has now been fulfilled and the Four Horsies sets and NEW 4" Lil Maddies are ALL available right here in our shop! And with NEW international shipping options, we are circumventing the US Postal Service's recent pricing apocalypse, and launching our own toy Pocalypse globally! CLICK HERE TO START YOUR OWN POCALYPSE. Tomorrow the truck delivers the Four Horsies to our warehouse! We will begin packing Kickstarter rewards tomorrow afternoon. This process will take a while. Thanks for your patience! Follow our social media (IG in particular: @the4horsies) for images of the delivery and packing process! Container should be offloaded very soon and sent to our warehouse for fulfillment to backers in early January. After we complete that, ALL Four Horsies figures will be available to the public in our shop here. Once everyone receives their Horsies, the 'Pocalypse can begin! Click here to purchase a 4" Red Hellfire Lil Maddie from our shop! The rest of the Four Horsies sets and Lil Maddie colorways will arrive by sea shipment later this year. Stay tuned for more info on that. Wrapping up production now, will post more detailed info about arrival dates once we have that info! Four Horsies and Tween Maddies are in production! We have great news: after several rounds of refinement, the Four Horsies sets and the 4in Tween Maddies are in production. Below we will share a few images of some of the final samples that will be pretty much how they will look. For all of these figures Klim has been favoring translucent figures with paint deco over that. So ALL of them have some sort of translucency, even Clash. Hard to see in the Clash image but the final version has a translucent smoke gray body under the armor. For your reference, in the images with the Four Horsies figures, the final version we are going with is on the right, and the previous version is on the left. VERY minor changes and updates between last version and final version but Klim is a perfectionist and wants to make sure these figures are as awesome as can be. Also to note: all 4 Four Horsies figures have articulated jaws! We also have many of the swag items for the Kickstarter in hand already, or in production now. Just received these proofs of our super cool Four Horsies button packs - four 1.25" buttons in a blister pack. These will be available in our web store alongside the Four Horsies figures once we've completed shipping to backers. We are looking at a potential arrival date of after NYCC in October, will update this blog with more images and info when they are available. 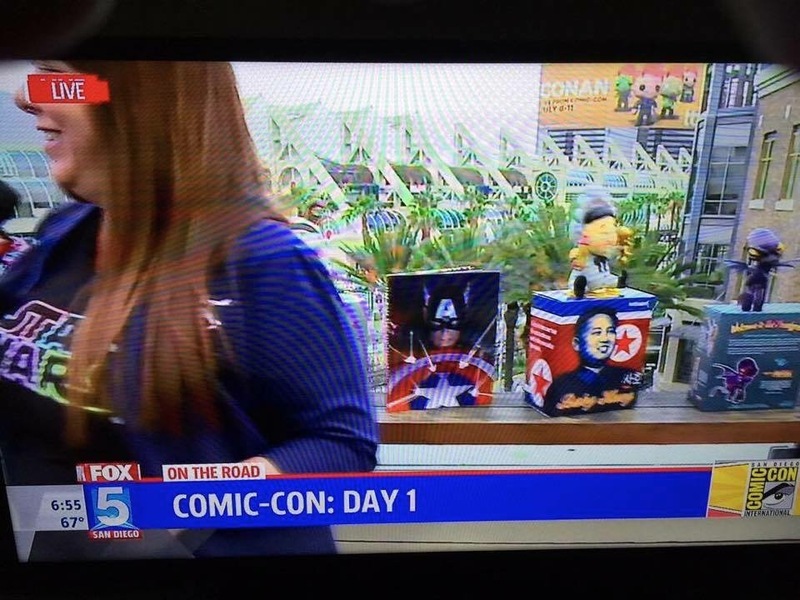 We had an awesome time participating in a scavenger hunt during SDCC which was set up by CNN iReporter Chris Morrow - the whole thing was run on her Twitter account. We donated some of our 6-inch Maddies to the event, as well as some of the Four Horsies wall graphics by Walls360. It was great to meet all the fans and get Little Maddie into their hands and on camera as well! Chris was interviewed by Fox 5 San Diego and our Maddies were there with her during the segment. 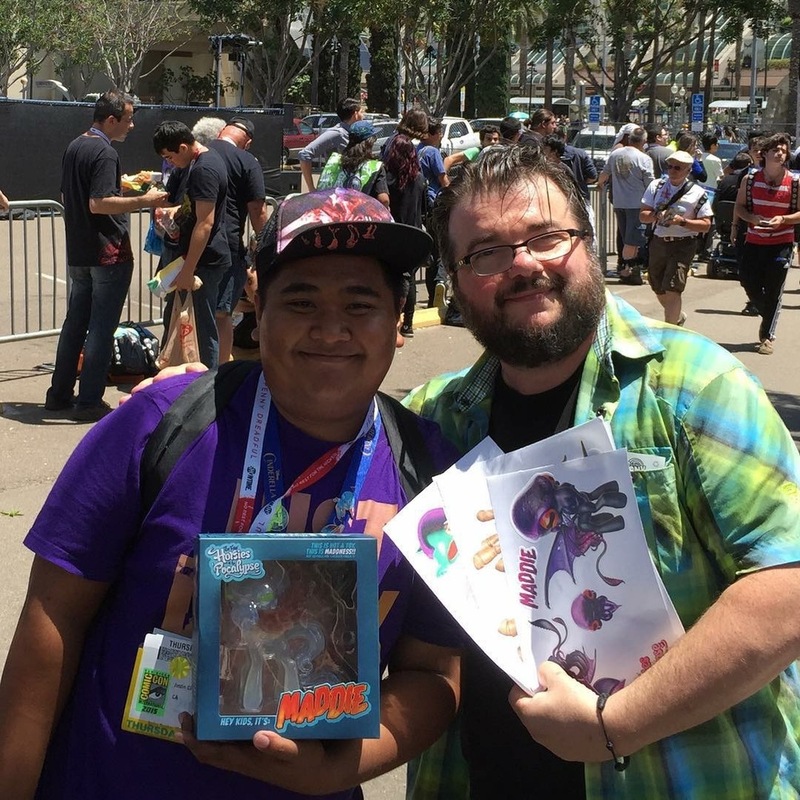 Big ups to Chris Morrow for organizing this awesome event, and to Chevy for sponsoring the hunt at SDCC! As you read in the past update, we received the factory paint samples before we left for the Licensing Expo. These are samples produced by the factory for Klim to examine, take notes on, make sure paint is right, functionality is right, and actually to mess around with until he breaks them. Sad, but that is part of the pre-production process. Klim will pass notes back to the factory and have them make the minor adjustments so that the figures are exactly as he wishes them to be. You will see from the pics below that our clear figures are CRYSTAL clear and look super cool. The painted figures are also insanely awesome- all painted Four Horsies figures are actually cast in translucent plastic so that they retain elements of translucency on some parts. Gives an extra added level of detail and visual complexity. You will also see in some of the pics that our glass cases at the Licensing Expo had lights inside them, which made taking pictures a little difficult, but definitely showed off the translucency! One of the many highlights of this show was Seth Green stopping by to chat and take pics of the Four Horsies. He was stoked that we are making these figures! As for production schedule, Klim will finalize his notes and tweaking next week- that means tweaks to both the figures and the moulds they come from. The packaging size/blister has been developed and the artwork will be designed next. Production of the actual figures will begin in about 2 weeks, and the production process takes 45 days. After that, the trip from the factory to our warehouse will be another 30 days. So we are looking at approx 3 months until we begin delivering rewards packages that contain the Four Horsies figures (September), assuming we have no delays in customs or in transit. In early June, Bigshot Toyworks will be exhibiting at the Las Vegas Licensing Expo at Booth W194. We will be showing off some of our best client work, as well as our FUnicorn and Four Horsies of the 'Pocalypse brands, plus other brand new properties! Click here to read the full press release. If you're attending the Licensing Expo, we are now taking appointments: email projects@bigshottoyworks.com to arrange a time and day with us. First images of Ghost from the Four Horsies factory! 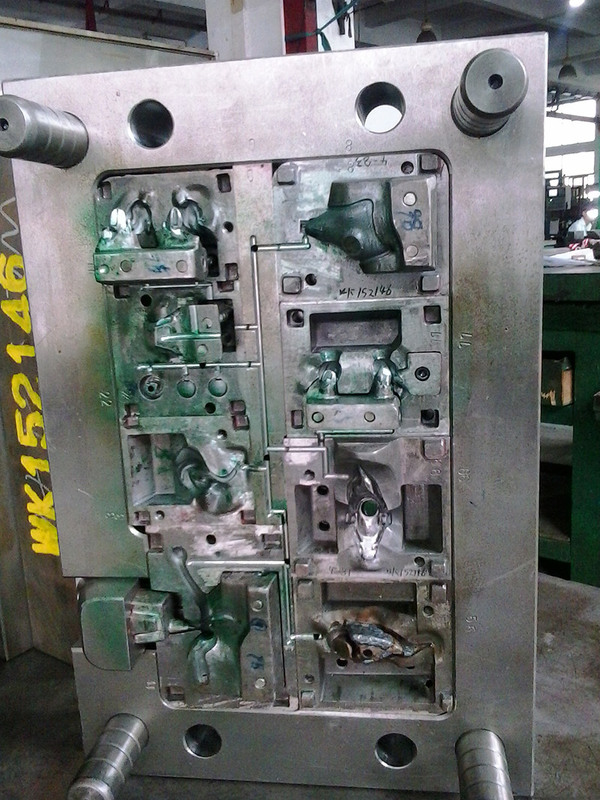 The first step to producing the Four Horsies figures is the creation of the "tooling masters" which help with nailing down the engineering of each of these figures. Will post more images (we have several of each figure) on the Four Horsies FB and blog. 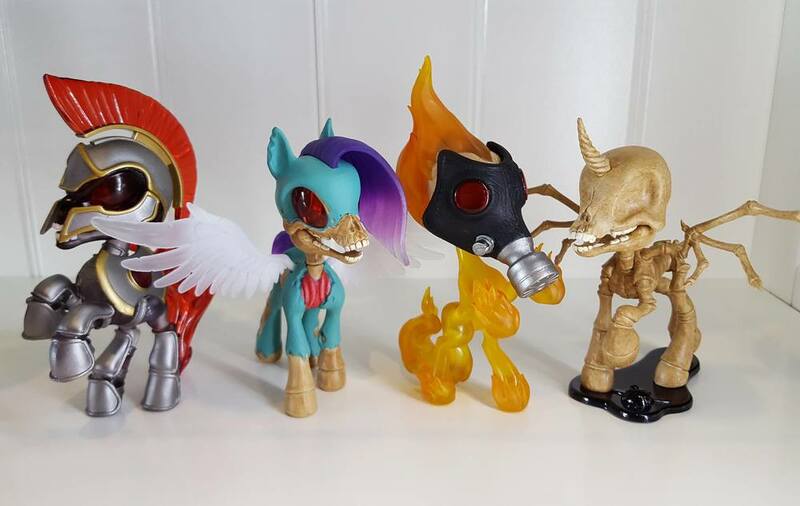 First images of Clash from the Four Horsies factory! The first step to producing the Four Horsies figures is the creation of the "tooling masters" which help with nailing down the engineering of each of these figures. Will post more images (we have several of each figure) on the Four Horsies FB and blog. First images of Raven from the Four Horsies factory! The first step to producing the Four Horsies figures is the creation of the "tooling masters" which help with nailing down the engineering of each of these figures. Will post more images (we have several of each figure) on the Four Horsies FB and blog.